Edurne Pasaban was born in Tolosa on 1 August 1973. 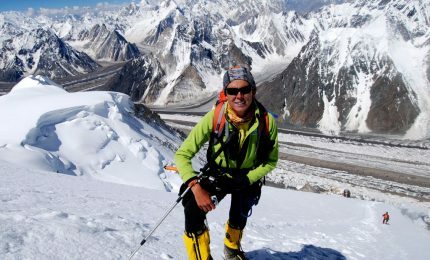 In addition to being the first woman ever to climb the 14 eight-thousanders in the world, she is an Industrial Engineering graduate from the University of the Basque Country, Master in Human Resources Management from ESADE Business School and Associate Professor of the Business Institute. On 23 May 2001 she climbed Mount Everest (8,848 m) for the first time and started her unstoppable professional career in high mountains: Makalu (8,465 m), Cho Oyu (8,201 m), Lhotse (8,516 m) Gasherbrum II (8,035 m), Gasherbrum I (8,068 m, also known as Hidden Peak), K-2 (8,611 m), Himalaya, Nanga Parbat (8,125 m), Broad Peak (8,047 m), Dhaulagiri (8,167 m), Manaslu (8,156 m), Kangchenjunga, Annapurna (8,091 m) and on 17 May 2010 she summited the Shisha Pangma, thus completing the 14 eight-thousanders. As a result of her devotion and effort she has received countless awards, such as the Gold Medal for Sporting Merit and the Queen Sofia Award to the Best Sportsperson of the Year in 2011. Nowadays, Edurne combines her sporting career with her increasingly close ties with the business world, an area where she works as a lecturer for both national and international companies and for sports, cultural and educational organizations.